United. City. Corrie. The Smiths. Oasis. Top mad fer it. Our kid. Manchester is steeped in cultural excellence. The few (some admittedly more serious than others) examples are just a tiny drop in the ocean. You can add 'craft beer destination' to the long list of brilliance. We'd been meaning to get ourselves up to Manchester to take in the beery delights of the city for quite some time now. 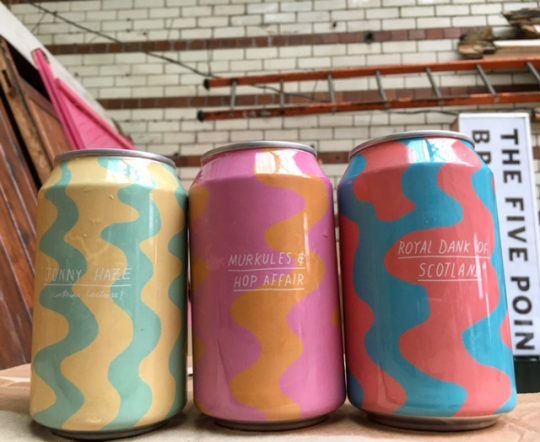 Mancunia is home to some of our favourite breweries and arguably rivals London in terms of wonderful drinking destinations. What better reason to finally visit than a beer festival? And what a beer festival. 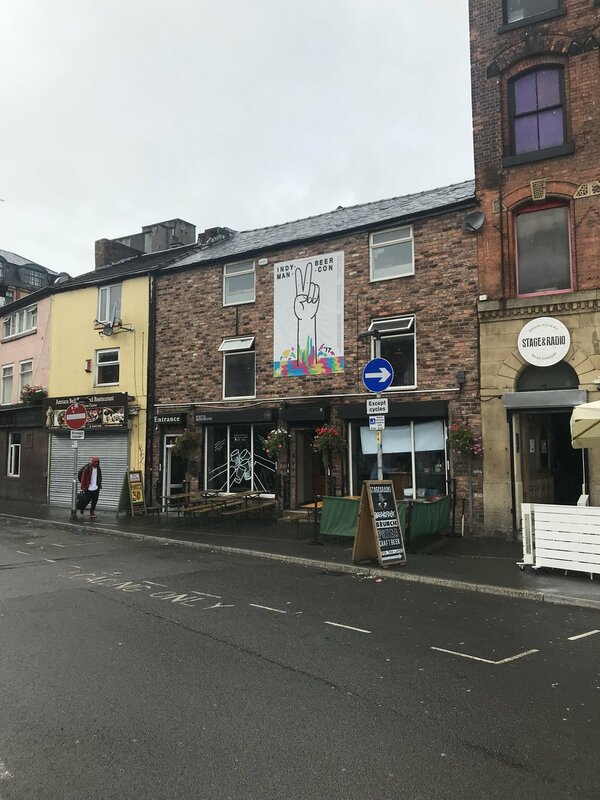 Before we ventured to the festival itself, we decided the sensible thing would be to head up a day early to hit up a number of fine watering holes we'd long earmarked for a visit. Here is a diary of sorts from our ridiculous weekend in Manchester. 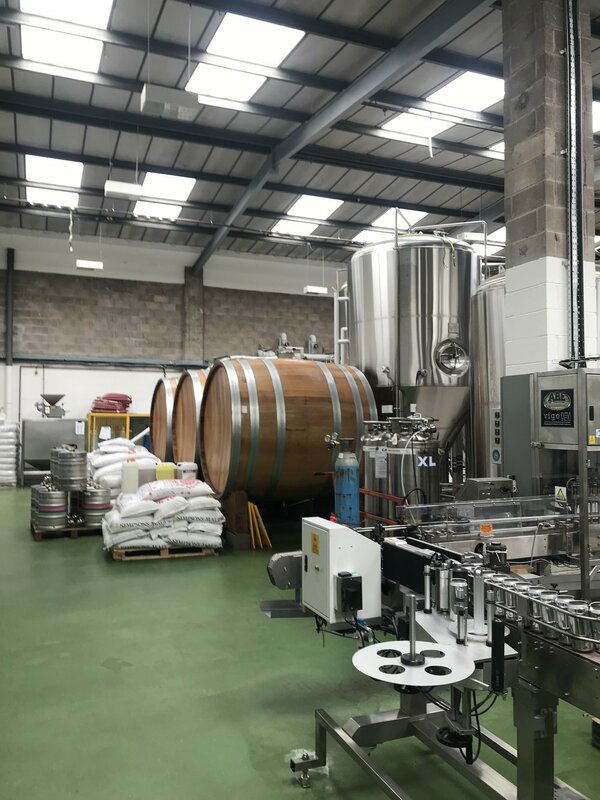 We arrived in Manchester at midday and there was only ever going to be one location we were heading to first, Cloudwater Brew Co. We had hoped to head to their tap room (the highly regarded Barrel Store) but it was closed for IMBC weekend as the portable bar kit was being used at the festival itself. No matter, we headed straight to the epicenter of Cloudwater. It was really cool to see one of my favourite breweries in the flesh after wanting to visit for so long and it's always nice to buy straight from the source. There were several bars hosting tap takeovers over the IMBC weekend, so we figured checking out a few of these was definitely a sensible decision. The rain was coming down hard (it's grim up North! ), so we soon made a beeline for Port Street Beer House to shelter from the conditions and to have our first beer(s) of the day. We were treated to a Burning Sky tap takeover and were spoilt for choice with the seven cask and eighteen draft options to pore over (and that's not even considering the bottle options). The highlights here were the Pretty Mess IPA and Imperial Stout. The former was just an excellent IPA, pretty light and refreshing and set us up for a solid day. The former was the polar opposite - rich, smooth, oaky and bags of chocolate. All washed down with a Manc Egg. A Manc Egg I hear you cry? It's a pickled egg, wrapped in black pudding and covered in breadcrumbs. Apparently Mancunian as it uses black pudding from Bury. I was sceptical that the pickled egg would be overpowering but it was actually really well balanced against the rich black pudding. Definitely a welcome lining of the stomach for the day ahead. A little light-headed we made our way to the hotel to check-in. Our hotel was in the perfect location and we had a quick pit-stop in the room whilst we charged our figurative and literal batteries. 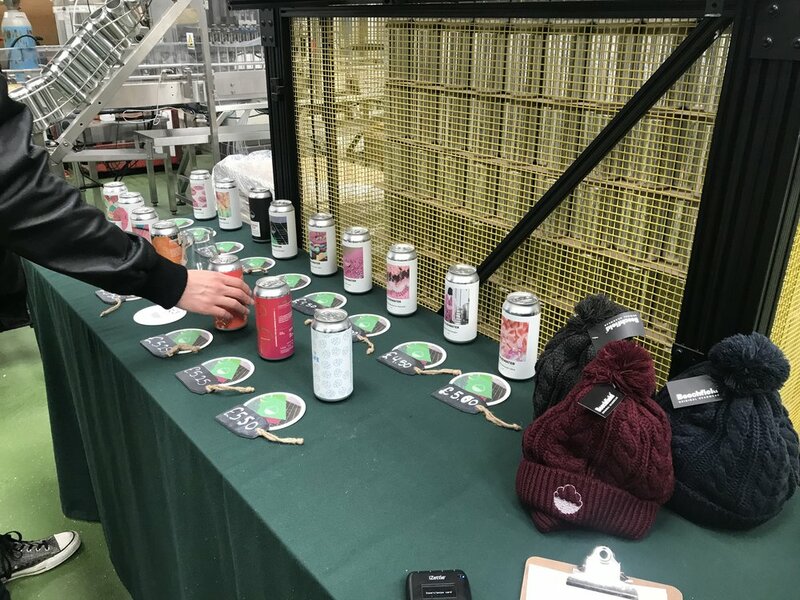 We also decided to sample some of our wares that we'd purchased from Cloudwater, namely the Taco/Cat collaborations with The Veil Brewing Co. (Go read Drunk in... September for a detailed review!). A few beers later we were ready to head back out into the city and made a beeline for 57 Thomas Street to begin our pub crawl proper. 57 Thomas Street is one of Marble Brewery's own pubs. It was only a fleeting visit here as we sat in the window upstairs people watching the streets below. I had a Frazzle Rock - a smoked beer brewed with Friends of Ham in Leeds to celebrate their 5th birthday. Smoked beers are really not my bag so I wasn't a huge fan of this. Next on the hit-list was Common. 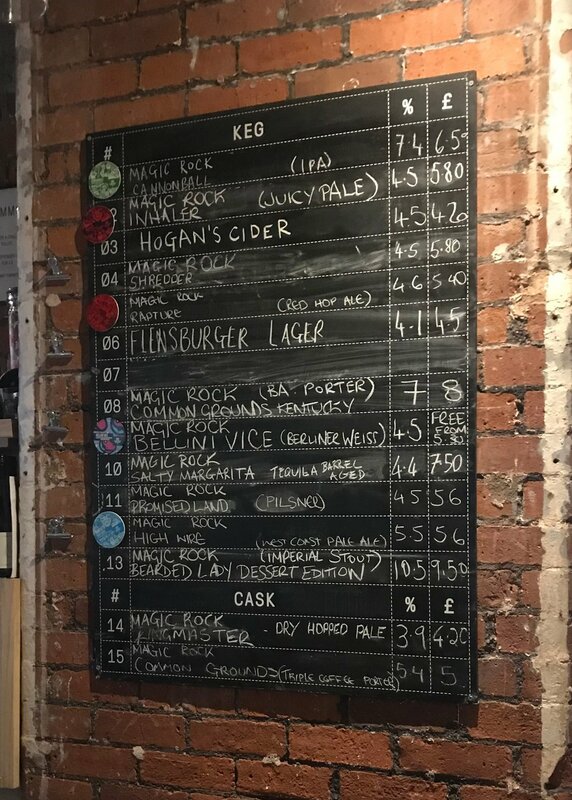 Here they were hosting a Magic Rock tap takeover so we were reacquainted with some old favourites in Inhaler and Kentucky Common Grounds. One a juicy pale ale and one a barrel aged triple coffee porter. The place had lots of Magic Rock decor and was a good level of busy. I could've easily spent longer here but we had much more to see and it wasn't long until we were off to the next watering hole. We made our way over to Pilcrow Pub. This pub looked like a fancy wooden shed and is definitely a shed I'd like to spend a lot of time in. It was getting a little bit later in the day now and so the place was suitably rammed. We decided to get our beers and chill outside with the deck chairs in Sadler's Yard. As it was a Weird Beard tap takeover, I settled on Curse of the Ryeclops - a wonderful rye IPA with bags of zesty Citra hops which really elevated beyond a regular rye heavy beer. Things begin to get a bit blurry here so we decided food was now the most pressing matter to attend to. We headed to Bundobust, a vegetarian Indian street food restaurant with a wide array of craft beer on offer. I'd love to be able to tell you about the food and beer in any great detail but the truth is I was feeling pretty drunk at this point so recounting this part of the evening is a bit difficult. What I do remember is that we inhaled the food at a ridiculous rate which is probably the biggest compliment you can give. At least I have a reason to go back so I can actually remember the food. It was at this stage of the night, I casually mentioned having been to rock club Satan's Hollow the last time I visited Manchester. This somehow resulted in us ending up in there a short while afterwards. Satan's Hollow is a ridiculous place. It's that one rock club that exists in whatever town you grew up in or went to university in. A place that's rooted firmly in the past with its never changing playlists; by no means a criticism when all you're looking for is somewhere to fall about a bit with your mates and drink cheap booze. We were suitably well oiled at this point and so the rest of the night is a cacophony of metal, pop punk, fist pumping, lyric shouting fun. We befriended half of the dancefloor through the medium of finger pointing and lyric chanting. At some point during all of this, I managed to drop my glasses on the dancefloor, crack them and lose a lens. Being an idiot, I didn't realise this until we were walking back to the hotel. It just made the night even blurrier than it already was. It was a pretty short stroll back to the hotel where we pretty much crashed out immediately after a ridiculous Saturday session. We hadn't even got to the main event yet! We rose more than a little worse for wear. A beer festival would obviously fix that, right? Luckily, our hotel was right next to a Wetherspoons so we devoured the all healing fry-up and were feeling slightly better. Things improved once we returned to Port Street Beer House for a swift drink before we headed over to the festival. Hair of the dog and all that. It seemed the opportune time to have Fourpure's Bath Bomb, brewed for IMBC '17. Billed as a tropical pale ale, it went down alarmingly easy and I was more or less back in the game again. Onward, the festival awaits! 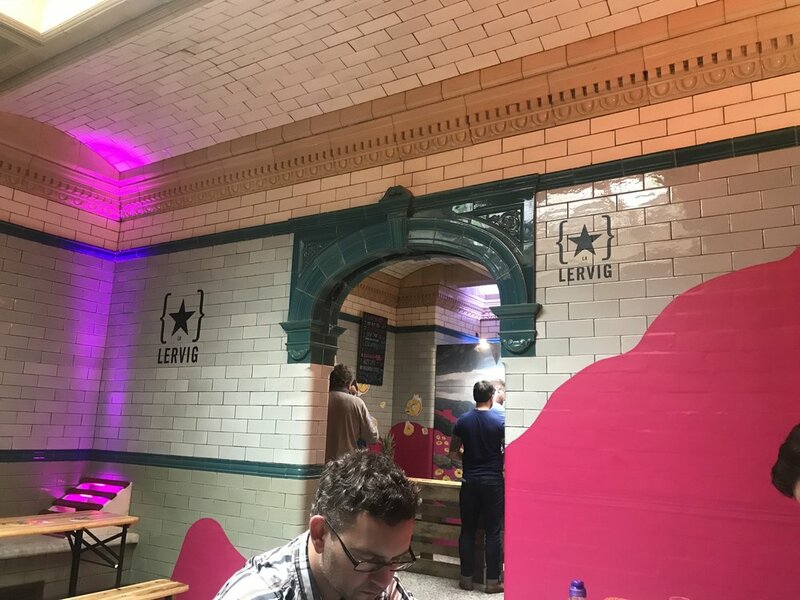 A short taxi ride to the Victoria Baths and an even shorter queue later and we were in. We were handed a glass and a programme and directed to the token stand. All beers at IMBC cost one token each and are served in 1/3 pint measures. An individual token was priced at £2.50 but if you bought in bulk then the cost came down a little (11 tokens for £25 worked out to be £2.27 a beer). I thought this was more than reasonable pricing and definitely came away thinking I'd enjoyed a lot of great beer at a very good price. The venue itself was beautiful - a listed Edwardian swimming pool and Turkish Baths complex, closed since 1993 and awaiting restoration. In the meantime it has been used for various events including this one. The organisers and volunteers did a brilliant job in decorating the many different rooms with various illustrations and colours and it felt as much an arts exhibition as it did a beer festival at times. It was great fun wandering around the venue and exploring both the two main rooms as well as the smaller rooms hidden in different nooks and crannies. I don't know if it was because we were visiting on the Sunday session and had had a particularly heavy Saturday but the whole vibe of the festival was very, very chilled. I absolutely loved the entire thing from start to finish. I should probably stop gushing so much. But I won't. It really was that good. 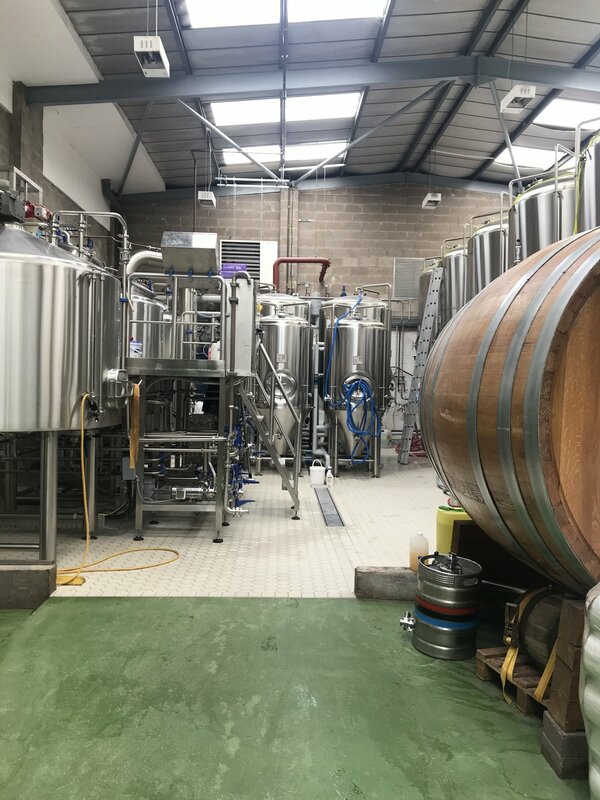 It's easy to make a comparison between IMBC and Beavertown Extravaganza as they were the bookends to September and whilst they are obviously both beer festivals, they both feel very different in what they are trying to achieve. BeaverEx is aiming itself squarely at craft beer enthusiasts whereas IMBC feels like it is aiming for a more broader crowd of beer drinkers. Beavertown Extravaganza is the bigger, brasher beast compared to the smaller, chilled creature that is IMBC. Saying that, they both feel very inclusive and welcoming and there's definitely enough space for them both to co-exist without muscling in on each other's territory. And that's why I love the beer community. I don't care how wanky that sounds. FIGHT ME. I'm planning on attending both again this year so long may they continue their same but different approaches. Cloudwater had a bit of a mis-fire with one of their DIPAs on offer, Big Pump. It felt a bit 'too green' and tasted a bit soapy and there was a lot of hop burn. However, they totally redeemed themselves with their imperial stout, Don't @ Me Nicolisa Husk. Siren not only get plaudits for their Old Fashioned barley wine but also because I was struggling to read the beer list (did I mention I'm a drunk moron that broke his glasses?) so they let me go behind the bar to get a closer look. Top chaps. Northern Monk delivered again with another stellar beer from the Patrons Project in Captain North, a collab with Cornish juice makers Verdant Brewing Co. I ended the festival with Wild Beer Co.'s The Blend 2017 - their celebration of their best sours from their barrel library over the last 5 years blended together. It was a welcome mouth puckering end to proceedings. I gushed about most of these in Drunk In... October so head over there for a comprehensive round up. As the festival drew to a close, I managed to pick-up some takeaway beers brewed especially for IMBC17, pictured below. Mainly because the colours caught my eye. I'm very easily pleased. We headed for the exit and back to the train station to voyage back to London. If you guessed that we immediately passed out as soon as we sat down on the train you'd be absolutely correct. A weekend of drinking is tiring work. 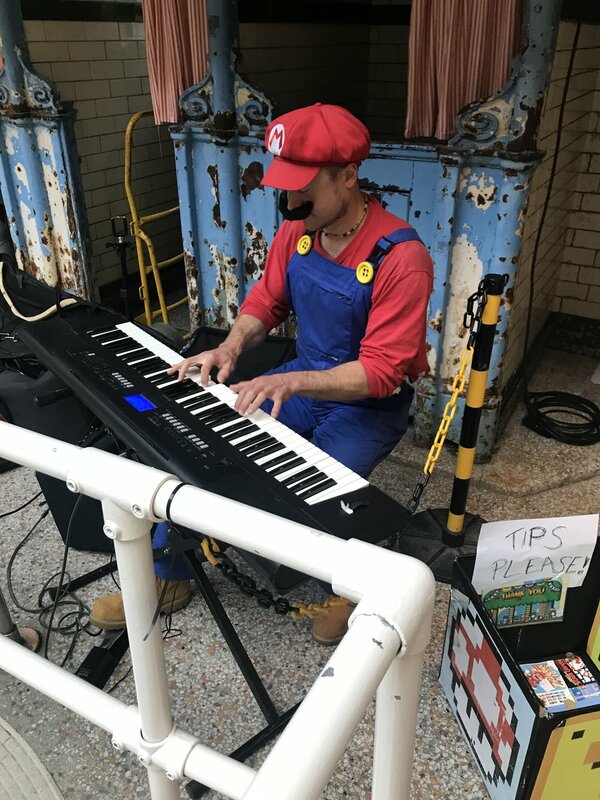 Manchester is great. IMBC is great. Beer is great. People are great. You are great. Told you I wasn't going to stop heaping on the praise. Make sure you go next year. That's an order.